The songs occasionally pay a little too much lip service to senoritas and siestas, but this collection makes my heart ache for the days of songwriting teams devoted to the craft of pop. Lieber & Stoller, Goffin & King among others contribute to the creation of a gloriously square interpretation of Spanish soul that renders me disgusted by today’s version of the hired hand. The other side of the two-fer, Don’t Play the Song, mostly abandons the Latino trimmings and aims straight for Sam Cooke territory. However, it lacks the sweaty grit of Cooke’s live recordings and aims for the silky-smooth moments of his most popular tunes. It is more “You Send Me” than “Don’t Fight It, Feel It” as he enters crooner territory with all the velvet, suede and whatever smooth substances I can muster in these fleeting moments. It belongs alongside the many moments recorded by the Stax, Atco and Motown labels that break my heart with a forceful cry, tale of woe or smooth enticement towards the wrong decison. 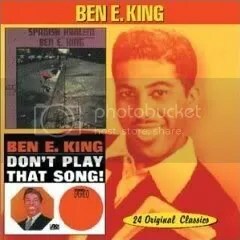 If you only know Ben E. King from “Spanish Harlem” or “Lean on Me” then listen to this and discover why he deserves to be placed alongside James Carr, Solomon Burke, O.V. Wright and other geniuses of his time.